Law enforcement officers receive DUI enforcement training on NHTSA field sobriety test procedures, including the DUI eye test (HGN–Horizontal Gaze Nystagmus). NHTSA is an acronym for the National Highway Traffic Safety Administration [NHTSA], a division of the federal Department of Transportation (DOT). The purpose of NHTSA is to reduce highway fatalities and serious injuries through suggesting laws, police training, and education. The acronym is commonly misspelled as NHTAS, NHTSA, NHTHA or NHSTA. In post-WWII America, millions of cars, trucks, and motorcycles were built and sold to citizens who had jobs that paid enough salary to be able to afford automobiles and their own transportation. The unacceptable statistics for drunk driving fatalities in national highway traffic reports, especially in the decades before mandatory seat belts and air bags, led to tougher new DUI laws being passed. Following the NHTSA’s suggestion, the accepted national BAC level of 0.15 was lowered to 0.10 grams percent in over half of the States. Other states reluctantly followed the NHTSA guidelines until 2000 when President Bill Clinton tied federal highway funds to moving that adult BAC level to 0.08 grams per cent. 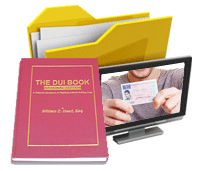 By 2005, all states changed the DUI law in their respective states. Starting in the early 1970s, NHTSA funded programs on national highway safety to undertake an investigation to try to standardize a set of simple, roadside evaluations to help distinguish drunk drivers from those who were merely drinking but not impaired. Not a single field sobriety test being used by police had been studied to see if the roadside screening could be correlated to a drunken driver, versus a person who had one drink. This point is highly important, because DUI-alcohol is the ONLY crime of degree in the world, meaning that adults can drink some alcohol and be perfectly legal to drive, but at some magical point the person can be a drunk driver just by virtue of a government-imposed BAC level. 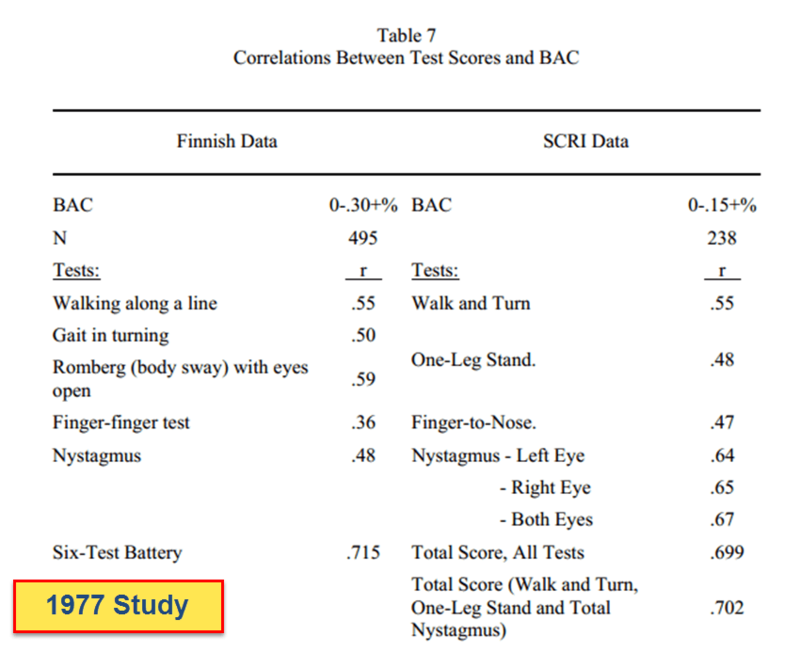 The HGN DUI eye test (as done by police, not doctors) has only been proven to help identify person’s legal alcohol limit in two controlled studies (1977 and 1981). Absent these two studies, NHTSA lacked a single standardized field sobriety tests that showed any reliability with suspected alcohol impairment. Importantly, this study isolated on alcohol and no other drugs. If the HGN testing is done correctly, involuntary jerking of the eyes of a person who has consumed alcohol — whether drunk or not — can be due to depression of the central nervous system caused by ethanol (alcohol). When an officer sees the slightest jerking, he or she then notes this as a “cue” or “clue.” Too often, marginally-trained officers and prosecutors improperly talk about this proving impairment, which this DOES NOT prove. 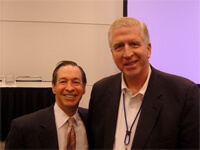 No physician in any medical school in America is trained to use lateral nystagmus testing to determine alcohol levels. Instead, blood alcohol tests are the gold standard, whether using a quick NADH enzyme method for a “ballpark” estimate or analyzing whole blood using a forensically-reliable testing method. The use of lateral gaze nystagmus testing by a trained physician is to look for a head injury, brain trauma, or a lesion on the brain. Furthermore, the results obtained for all NHTSA evaluations, including the HGN DUI eye test, were only correlated to which test subjects were over the legal limit and not correlated to driving impairment or the ability to drive. In addition, the NHTSA-funded research was never peer-reviewed, which is a critical component in REAL scientific research. 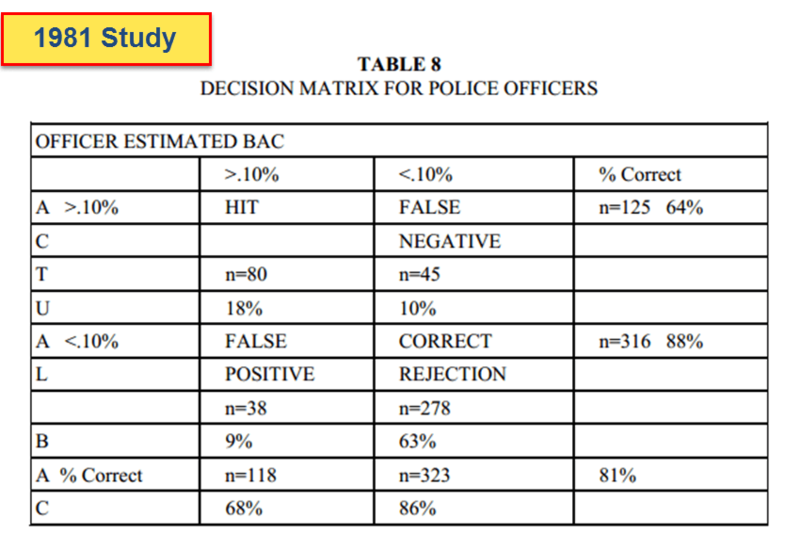 Subsequent researchers, like Rubenzer and Hlastala, have shown that the NHTSA methodology and findings were flawed and that the NHTSA evaluations are non-specific for either accurately making arrests for intoxicated driving or predicting BAC alcohol numbers. Plus, the presence of alcohol is a person’s bloodstream is one of a possible 50-plus nystagmus causes that have been documented by Dr. L.F. Dell’Osso, Ph.D. and others for over 30 years. A few types of nystagmus such as rotational, geotropic nystagmus, congenital nystagmus, optokinetic nystagmus, and BPPV nystagmus show that MANY other causes of eye movements are possible causes of horizontal nystagmus. 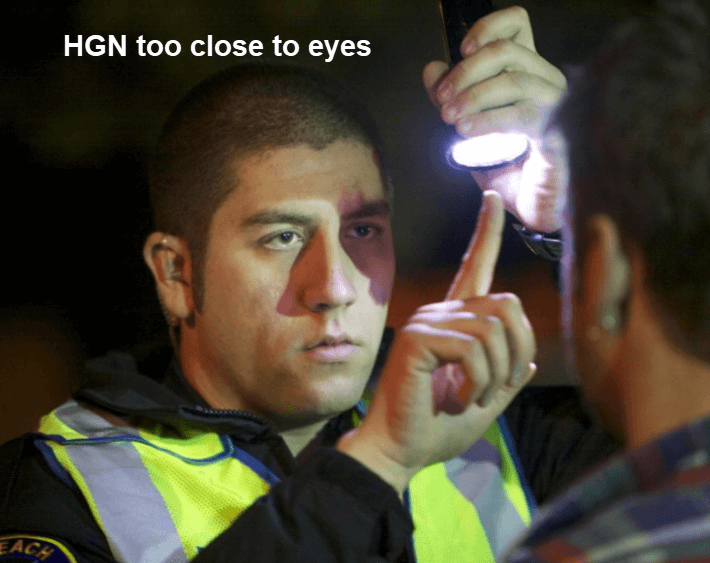 Considered the most reliable of the 3-Test Battery of roadside impairment tests used by police officers, the HGN DUI eye test is supposed to identify horizontal gaze nystagmus in the suspected DUI-alcohol driver’s eyes. This is dependant on how the driver follows police instructions insofar as submitting to an evaluation of the presence of nystagmus, or the involuntary jerking of the eyes, as lateral movement of the eyes is requested during the three types of eyes tests administered. The requirements of proper administration start with qualifying the person as a proper candidate for testing the eyes before any passes are attempted by the investigating officer. A percentage of all humans have natural nystagmus, and this medical condition in no way disqualifies those people from getting a driver’s license. A Texas study, done by former state-police academy NHTSA trainers (Walden and Platt), showed that 98% of all field sobriety tests were done incorrectly in assessing thousands of Texas police officers’ videos. Proper technique mandates that the officer hold the stimulus the correct distance from the eyes (12” to 15”), slightly above eye level (no higher than the person’s natural eyebrows), and that the police officer move the stimulus no faster than 30 degrees per second. The following images show numerous flawed methods being used, just so you know their report was accurate. 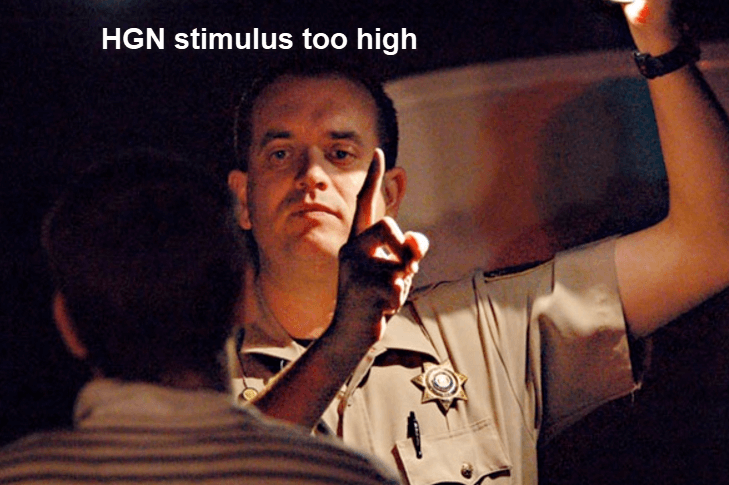 Once the HGN clues are observed, virtually every officer assumes that this drunken driving investigation will be an arrest decision despite the wide range of nystagmus causes known to medical science. In fact, NHTSA training provides that seeing 4 of 6 clues is an “arrest decision” for the DUI officer. 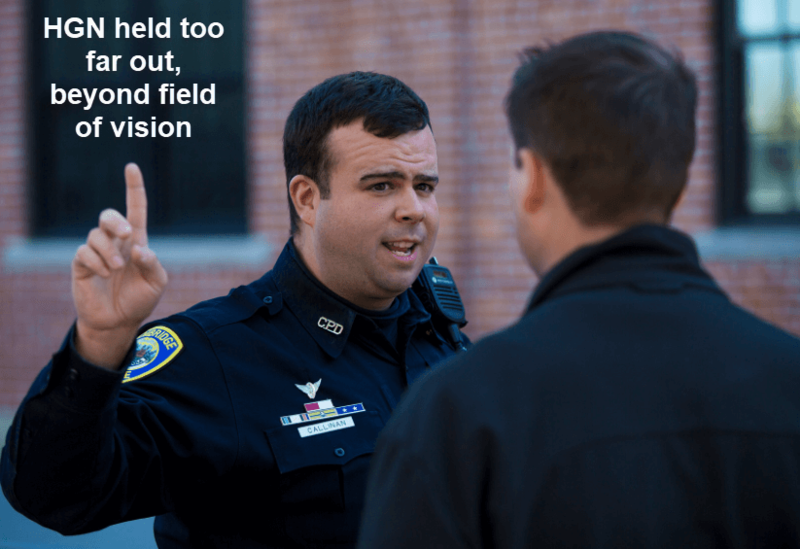 Any officer who sees the eyes not tracking evenly as the subject’s eye tries to focus on the object being moved side-to-side (this usually is a fingertip or top part of a ballpoint pen or a small penlight) will be biased toward an arrest decision before starting the other two standardized tests: the walk-and-turn (WAT) and the one-leg stand (OLS). Unavoidably, the grading of an eye test for HGN clues is subjective. Because each eye is evaluated separately in the HGN field sobriety test, up to 6 clues may be observed and scored by the officer. Unfortunately, about 90% or more of officers investigating an alcohol-based driving under the influence case (DWI-DUI) perform one or more aspects of the multi-part DUI eye test incorrectly, which invalidates the reliability of any reported results. However, most courts in America gloss over the junk science and flawed administration of the HGN tests. 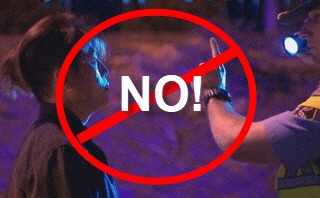 Officers routinely perform defective field sobriety tests, but due to the very bad decisional law (appellate cases) in most states, a Judge will permit a jury to decide an accused driver’s guilt or innocence. This fact puts a premium on finding the right DUI lawyer to fight drunk driving cases to prevent a wrongful conviction. This is why the best DUI attorneys tell EVERYONE to decline taking ANY field sobriety tests, including the HGN DUI eye test. All tests are VOLUNTARY, and no penalty or driver’s license suspension accompanies your option to say NO to field tests. Police trained in NHTSA standards are also trained to always change the position and movement of the stimulus to look for vertical gaze nystagmus. This VGN (vertical gaze nystagmus) is supposed to indicate a “high BAC level for this individual” or the use of PCP. No VGN eye test is performed until the law enforcement officer has first fully evaluated horizontal gaze nystagmus in the suspect. To accomplish these vertical passes, the officer changes direction and movement of the stimulus from side to side (lateral movement) and then moves it in a vertical manner. 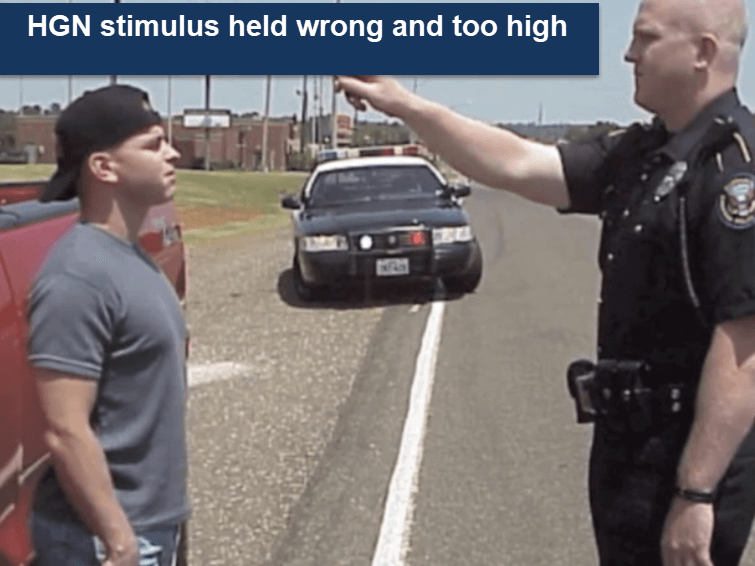 Two passes are required to move the stimulus up and down slowly, then the officer must hold the object at the top position for about 4 seconds to see if the eyes show vertical nystagmus. This is NOT a “scored” clue like the one done for the HGN DUI eye test. Click on the link to see what VGN looks like: the #1 YouTube video posted by the author. 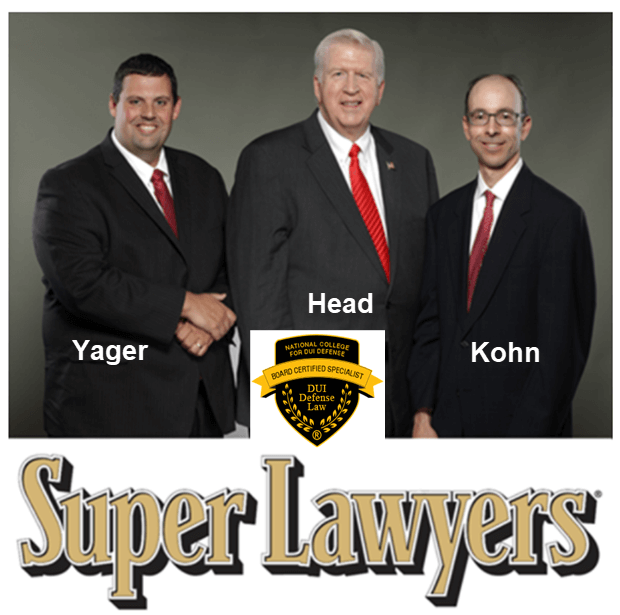 Call our Super Lawyers for expert handling of your DUI case in Georgia. We can even REFER you to a top drunk driving lawyer in any other state. 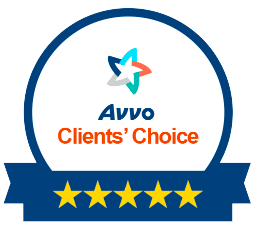 The CALL and INITIAL advice are FREE. Call 404-567-5515, or toll-free at 1-888-384-4323 [1-888-DUI-HEAD]. 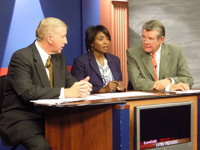 Bubba Head, Larry Kohn, and Cory Yager are here to help you.